This is Charles Wheeler's right arm. In case you can't tell, he loves video games. A couple of years ago, he decided to get a major tattoo. 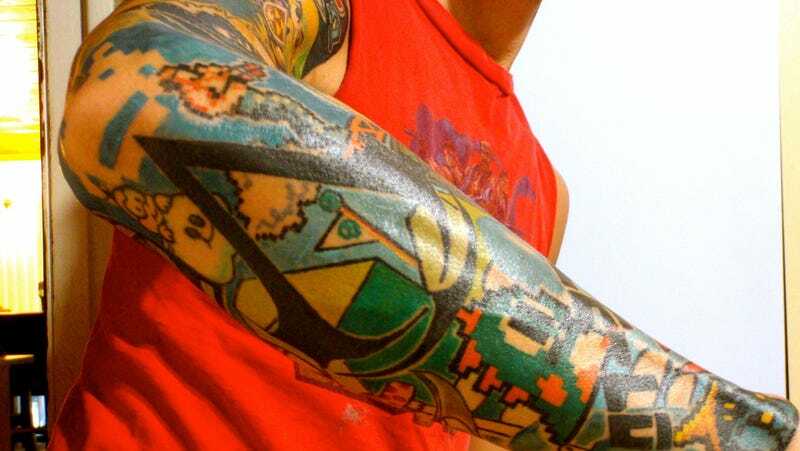 "I had wanted to do a sleeve but could not figure out an idea," he told Kotaku. "Then I said, 'Why not a gaming sleeve?'" The 30-year-old native of the Florida Keys has loved video games since he played Alex Kidd and Psycho Fox on the Sega Master System. It took two years for an artist friend of his at Key Largo Illustrations to do the sleeve. Charles is very happy with the results. After we ran a big post about great gaming tattoos, he couldn't resist sending pictures of his. Who can blame him? We had some good entries, but Charles' might be the best. Look at all the games he's got on his arm! Or... um... ok. Earthworm Jim is a little weird there. Take a bow, Charles. And let us know when you're going to do your left arm.